Is that last image a preview of something we are going to see in the Corridor of Dreams?! Looks like it could be our first glimpse into Casca's mind. 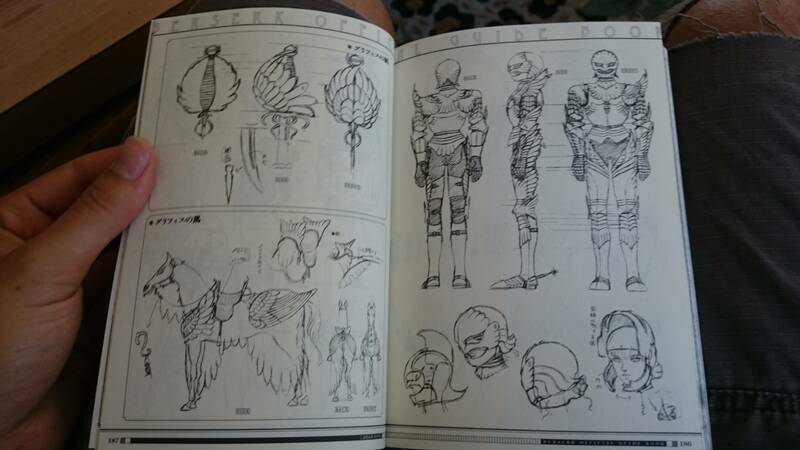 There are some other pages too I'd like to describe for anyone interested. I don't know if anyone has posted these yet. There are some other panels, two depict a gaunt and exhausted dog dragging by a chain around its neck a coffin encrusted with the Falcon symbol, another panel depicts the dog being attacked by four cloaked beings with what looks like spears. 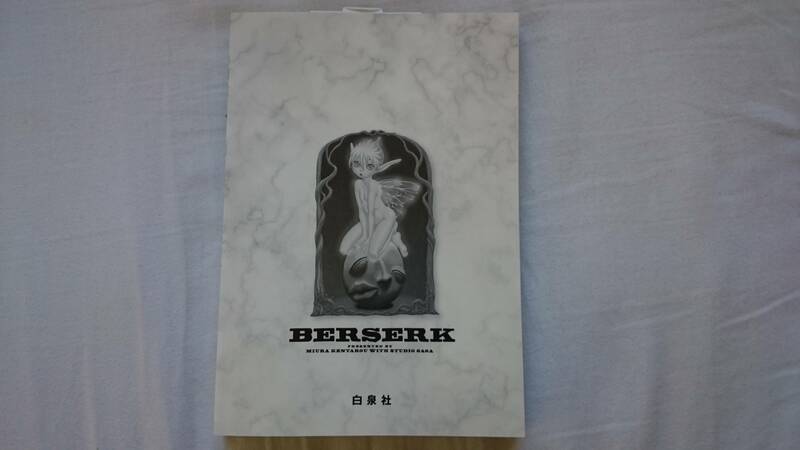 Another panel of the inside of the coffin shows what I assume is Casca with pieces of her missing, kind of like Griffiths appearance in the IOE chapter, with the brand in the middle of her chest, with cracks seeping out of it, the texture kind of implies it's meant to be a doll, I'm not too sure. 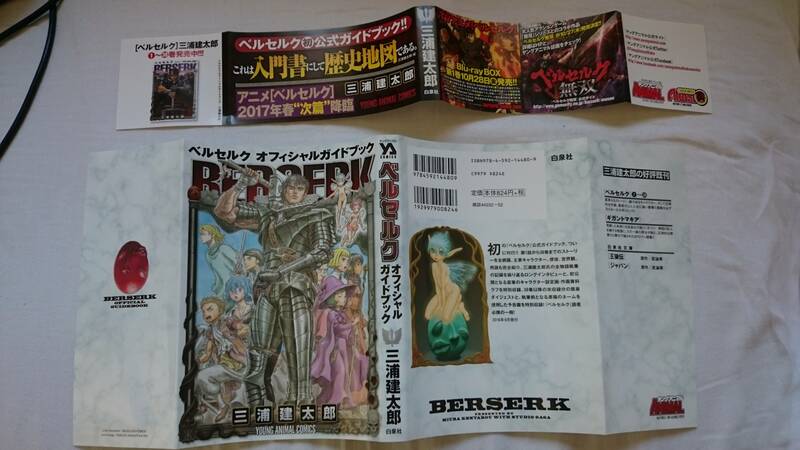 Two other panels show what could either be Casca in her current form or the moonlight boy. 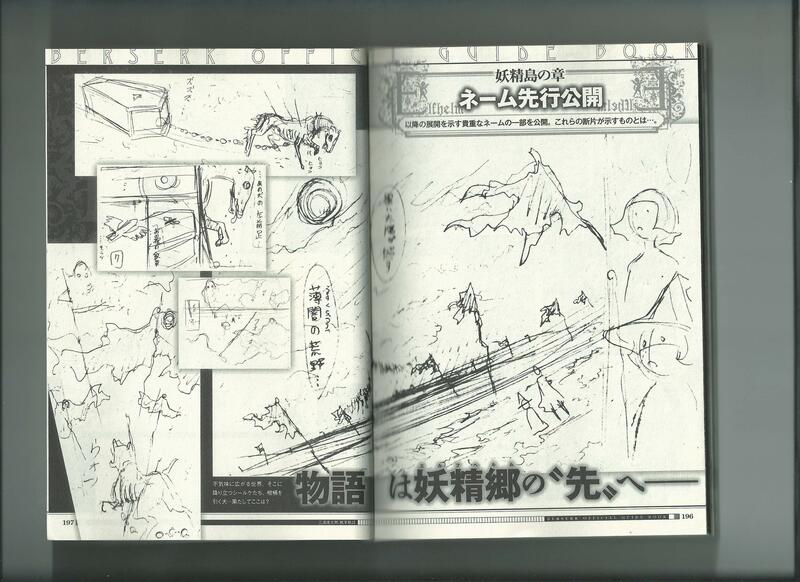 And there is a full page of Guts' crew at the banquet messing around, with a downtrodden Magnicio cleaning up. The last panel shows Guts watching in the distance with a stern look on his face. There are some other panels, two depict a gaunt and exhausted dog dragging by a chain around its neck a coffin encrusted with the Falcon symbol, another panel depicts the dog being attacked by four cloaked beings with what looks like spears. Another panel of the inside of the coffin shows what I assume is Casca with pieces of her missing, kind of like Griffiths appearance in the IOE chapter, with the brand in the middle of her chest, with cracks seeping out of it, the texture kind of implies it's meant to be a doll, I'm not too sure. 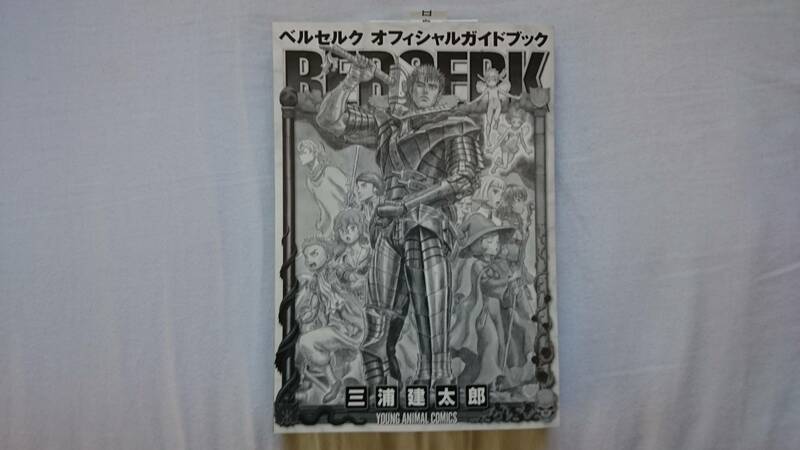 Two other panels show what could either be Casca in her current form or the moonlight boy.And there is a full page of Guts crew at the banquet messing around, with a downtrodden Magnicio cleaning up. The last panel shows Guts watching in the distance with a stern look on his face. Well, now my package really can't come soon enough! If I'd known I would have had it shipped by EMS! Wow, thanks for sharing! My zen-like patience for ep 348 just got a little less easy to bear. Miura is going to be presenting abstract imagery to represent Casca's trauma, some of which may be difficult to interpret. Personally, I read the portion about the dog and immediately thought of Casca's year as the Falcon's leader -- how exhausted she was by the end of it, keeping them alive despite the overwhelming odds. At any rate, the ep 348 thread is going to be very active. Thank you Kaladin as well as Bludfyr. Very interesting as previously said, yet also still very mysterious. It's pretty obviously a horse dragging the coffin around, and the imagery makes it clear the coffin bearing the Band of the Falcon's crest contains Casca's broken ego, or at least a portion of it. Very curious what the ghostly robed figures are/represent as well. Is it the rags on poles that morph into these? Man, that suspense... Also very intrigued by that child-like figure. It's not the boy, it's yet another representation of Casca, and I think it's one that's hiding itself. It's "the thing in the Abyss of Casca", as the text says. To anyone who hasn't purchased it yet but wants to; the site says there are only 20 copies left in stock, so get it now while you can! Ordered mine. Only 15 left. The horse is a very nice analogy for Casca's state right before the eclipse, being as worn out as she was. Some really interesting imagery there, the coming episode seems like its shaping up to be one of the best episodes yet. Only Miura could make his rough storyboard sketches look creepy in their own right. That shattered doll that's supposed to be Casca and the withered horse dragging her are going to be haunting my dreams tonight. Interesting, I wondered too wether it was a dog or a horse, the way the animals legs are spread out in the left hand image with its mouth open, and its long chest made me lean towards dog. The inner Casca, makes me wonder about what Danan said about the rules of Cascas dream realm, and what method will be used to put Casca together again so to speak. One thing i find really interesting about that broken Casca figure in the coffin are the places that are cracked. The most obvious one is the genital area. Additionally her right arm and left eye seems to be cracked too which is the complete opposite of what Guts has lost during the eclipse. Im also really happy that we got to see these scripts. Can't wait to see the outcome of the Art. Im pretty sure that this is a horse. Finally got to read this one. Wow. The preview sketches: I'm pretty sure what's on those poles are skins. The more ghostly images of them are them partly filling with wind or animation so that they're more recognisable. And it's interesting to see that her psyche has decided that she's symbolically dead. It looks like the lil tiny her is hiding inside that. I can't really tell of course but I think you guys are right that the shattered ego is a stylised puppet/doll rather than a sketch that will be finished as a more literal corpse. If that's the case it could be a layer of her feeling like/deciding (for the protection of her psyche) she was inhabiting her own character, 'faking it' and really being something smaller inside. So that she could go on, albeit as this only partly 'there' being, because what was broken and is now symbolically dead could be 'fake' and not 'really her'. I think the emaciated creature might be a dog also. In the first pics of it chained to the coffin it looks horse-like, but in the pic on the bottom left when the flying figures are attacking and it shows the creature from behind it looks like a dog to me. It looks like it has a dog's tail and it's stance is more dog-like, like it's protecting the coffin. I wonder if the animal is supposed to represent Guts. It looks like it might either have a lame left front leg or be missing part of it. Anyway, VERY interesting stuff! Just arrived in the mail! Haven't even had a chance to go through all of it yet. 199 pages. Looks like there's not really anything new in here as most of us expected (besides the last four pages which we've already seen) but then again, I haven't gone through it thoroughly. I will say though, having only owned the Dark Horse volumes, the print quality of this is much much better in comparison. Maybe it changes forms according the circumstances (her perspective of things). I believe it represents Guts (I mean it is kinda obvious I guess), dragging/protecting her around, we've seen it. I actually didn't notice the leg :), very good observation. Agreed, that's Guts. It's a very haunting metaphor of the current journey. We also get to see Puck and Magnifico doing their community service, so the next episode won't be all gloomy. I want to say, I've been really impressed by how naturally Miura's managed to blend the serious and silly bits together in the last couple of episodes. I don't know about all that. Feels like a stretch to me. The portions that are most damaged are the head, chest and arm. I also don't think it's meant to imply something regarding Guts. Lucky you! Thanks for the pictures! I think the emaciated creature might be a dog also. In the first pics of it chained to the coffin it looks horse-like, but in the pic on the bottom left when the flying figures are attacking and it shows the creature from behind it looks like a dog to me. Well after checking, the text explicitly mentions a dog, so I guess that's that. The top pictures really make it look like a horse to me, but it's probably just because they're quick sketches. I wonder if the animal is supposed to represent Guts. It looks like it might either have a lame left front leg or be missing part of it. Its left side is definitely damaged, so that makes this interpretation quite likely. Thanks for the sneak peaks -cause! Ya I was pretty amused when I saw that. Pretty clever to get ideas for apostle forms from dinosaurs' anatomies. No wonder the bodies of apostles are always so unique, a part of his reference material comes from creatures who lived 65.5 million years ago. Of course, each apostle also gets their own healthy dosage of demonic attributes as well. My copy of the Guide Book came in today. Neat stuff. 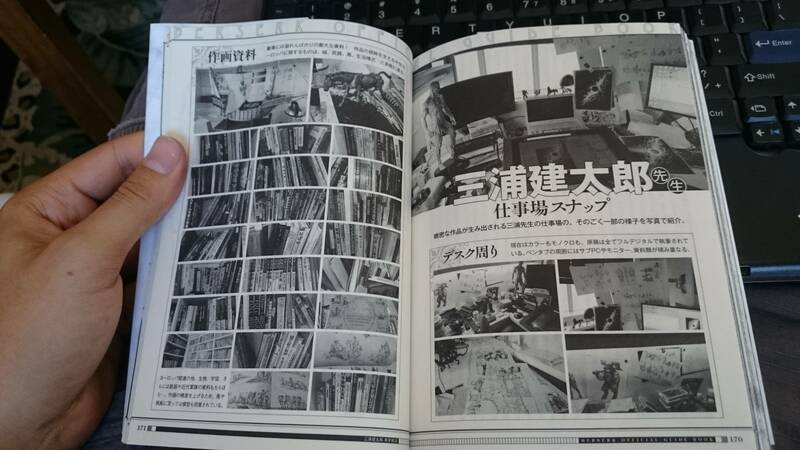 I don't think I saw anyone else mention it, but there is also a 12 page interview with Miura inside. I hope we get a translation from Dark Horse. 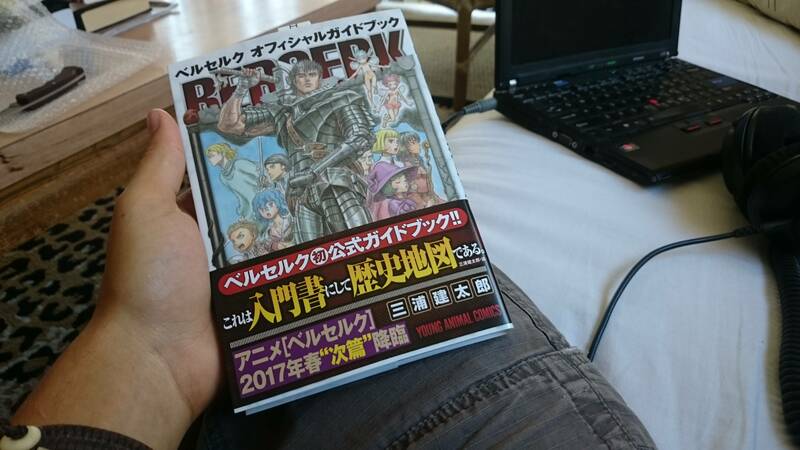 I don't think I saw anyone else mention it, but there is also a 12 page interview with Miura inside. Walter mentioned it a while back.